A lot of work goes into maintaining sports pitches behind the scenes, ensuring that the games can go ahead with specialised staff dedicated to caring for the turf throughout the entire year. We are Matchsaver, a company proud to lend a hand to those hard working professionals and helping them to ensure fixtures take place when they are meant to with our popular football pitch cover systems. With our range of products we offer viable solutions for large stadiums, training grounds, and other types of sports grounds. All our coverings are made out of a strong and durable material which protects natural or artificial grass surfaces from snow, frost, rain, and ice effectively. They are UV stabilised, and manufactured specifically for the purpose. By working closely with leading agronomists, we have developed a material that allows enough sunlight to pass through, creating prefect conditions for natural grass to grow. In addition, by blowing warm air under the covers, we can create a viable alternative to under soil heating. If you already rely on under soil heating, you will be glad to know that our services can help lower your heating bills. Our experienced engineers can install the option you have chosen along or across the pitch, depending on the layout. Our football pitch covers are durable enough to deal with all kinds of adverse conditions. For example, if it snows heavily, our covers are strong enough to withstand tractors fitted with brush attachments to remove the snow. With this in place, bad weather may never again be a cause for the postponement of a match. Our football pitch covers are available in 3 types: automated pitch protection, air roller systems, and simple pull on covers. Automated pitch protection is a popular choice, and only requires a small number of staff to operate. 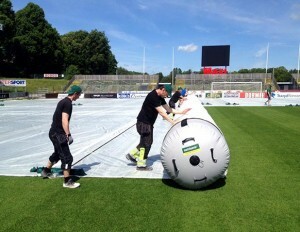 It uses between two to four motorised rollers to cover and uncover the pitch. Uncovering is done by setting the rollers into reverse, which results in a great way to neatly roll up the covers. Our air roller systems are extremely effective for covering and uncovering pitches. The inflatable rollers provide a convenient easy storage option for those with limited space. We also offer a full range of convenient, perfectly-sized pull on covers. We are here to answer any questions you may have and provide you with any additional information you may need. To get in touch with us, give us a call at +44 (0) 1642 718945 or send us an email at enquiries@matchsaver.com.